Southborough has always had an impressive showing at the Boston Marathon, and this year is no exception. Between now and Patriots Day, I’m featuring stories of resident runners donning bibs for a cause. This is the first. This year will mark resident Nathan Rhind’s first run in the Boston Marathon. That’s not a surprise, since he’s still in high school. a place that provides emotional and physical support for individuals with disabilities and their families. Rhind first connected with the center through work he did for his church youth group. Now he hopes to helps support the center in a bigger way by contributing to their biggest annual fundraiser. an organization that I have grown to love more and more over the years and numerous times I have been able to visit. 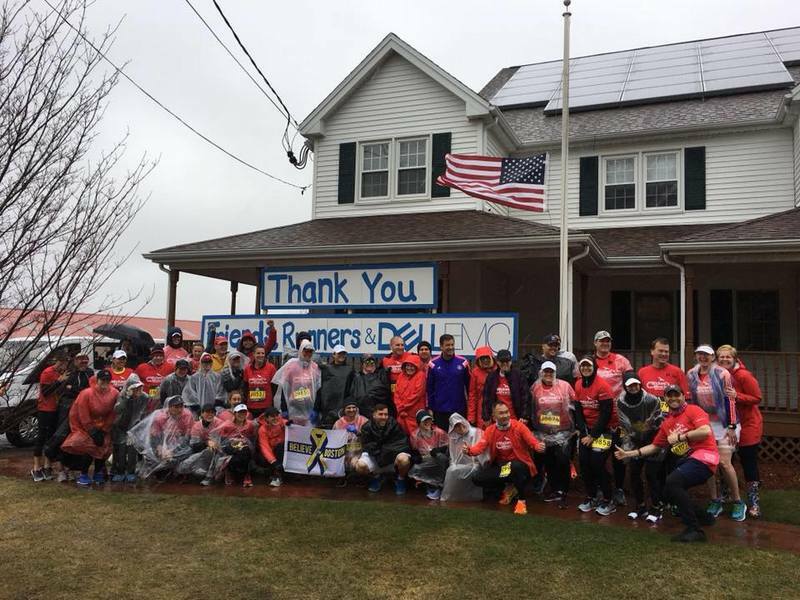 The Respite Center, located in Hopkinton just a mile from the starting line, is an official B.A.A. charity that provides services for children and adults with disabilities. It has several programs which include our Adult Day Program, Weekend Respite, After School Care, Day Care (birth – 3yrs), Employment Support for Individuals with Disabilities and Residential Placements. I was first introduced to the Respite Center by my youth minister and the small service trips we would take the Respite Center to mow the lawn, mulch, and overall try to alleviate the burden of extra costs for landscaping that can be better put to use for helping clients. I thoroughly enjoyed this work as I know my friends and fellow youth group members did as well. I decided to take it a step further and run for the Respite Center because I was incredibly touched by the clients. Their kindness and positivity motivated me to do everything I could to improve their experience at the Respite Center and to repay what generosity they showed me. With your generous support, I am confident the Respite Center can continue to provide these essential services to clients. I have seen firsthand the benefits it has provided families. When I stepped inside to discuss running this year’s race, I was welcomed by familiar faces and some new ones as well, both happy and included in the Respite family. As the Marathon is located right at the start line, they were all excited and already looking forward to April 15th, as this is by far the biggest fundraiser of the year for Respite. Last year the Respite Center raised just over $600,000 with a team of 72 runners. These funds made it possible to grant scholarships and also provide over 40,000 hours of service to families in need. For more information on the Michael Lisnow Respite Center, click here. To support Rhind’s fundraiser, click here.